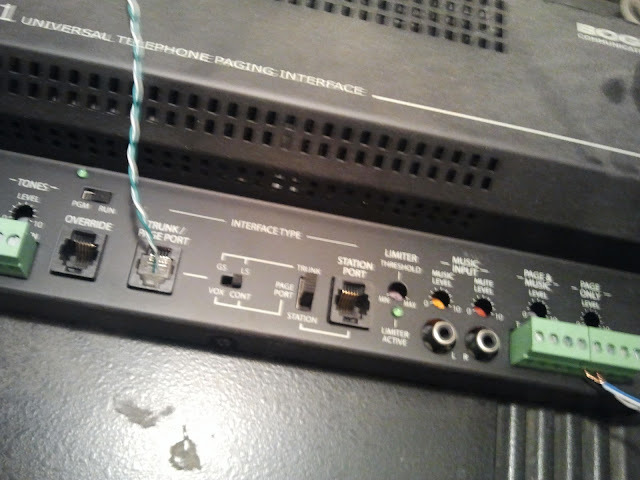 destination-pattern 333 <----- dial "333"
Now, the physical connection comes from my FXO port down to this thing called a 'Universal Telephone Paging Interface'. This thing has a port called a 'Trunk/Page Port'. That is where the FXO goes into. You see in the picture below the blue/blue-white pair. That goes to the FXO port. From there, on the right side, that goes into the back of the Bogan system, which has several knobs for volume, etc on the front. The back has the wiring, and I cant tell you how that thing is wired. It was already wired in the back, but I suppose the overhead speakers come into the back and the page is distributed through there.